3-Row 15'L Low Rise Preferred Seats 30 - 303lbs. 3-Row 21'L Low Rise Preferred Seats 42 - 427lbs. 3-Row 24'L Low Rise Preferred Seats 48 - 496lbs. 4-Row 15'L Low Rise Preferred Seats 40 - 487lbs. 4-Row 21'L Low Rise Preferred Seats 56 - 650lbs. 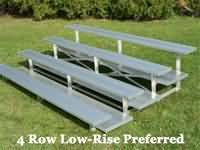 4-Row 24'L Low Rise Preferred Seats 64 - 749lbs. 4-Row 27'L Low Rise Preferred Seats 72 - 702lbs. 5-Row 15'L Low Rise Preferred Seats 50 - 755lbs. 5-Row 21'L Low Rise Preferred Seats 70 - 1033lbs. 5-Row 24'L Low Rise Preferred Seats 80 - 1187lbs.